We offer a steady growing number of Hostas for sale in our online-shop and we hope that you will find the right hosta(s) for you. 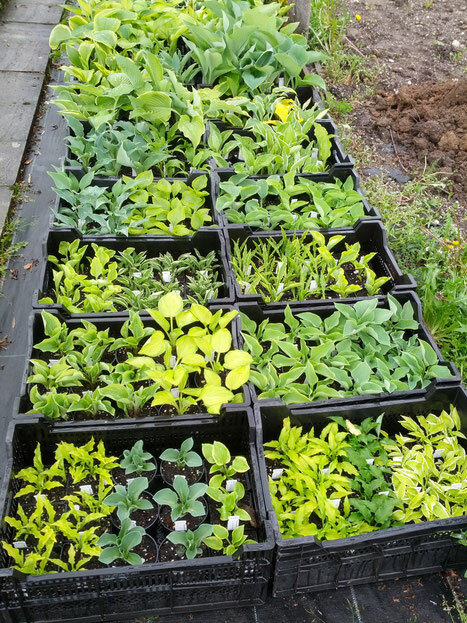 Because of the fact that we are only a small sideline nursery we only offer small numbers of each variety so it is possible that there is not alwas every Hosta available. We hope you do understand this. This is also the reason why we only offer prepayment. After you placed your order you will immediately receive a order confirmation. This only shows you that we received your order. After we checked if every plant is available we send you a confirmation with all available plants and the invoice total which you please transfer to our account. After we received the money we send the plants on the following Monday to avoid the plants to lie about at the post office. We do not only send our Hostas to Austria and Germany but also to other EU-states. Unfortunately we can't send to Switzerland because of high tolls. We send our plants from March to November depending on weather conditions (temperatures). Exceptions are hot summerdays with temperatures exceeding 30°C. The plants would suffer badly with such high temperatures. We send plants bare rooted which means without pots and soil. This is no problem for Hostas. We ask you to unpack the plants immediately after they have arrived with you, water them shortly and plant or pot them straight away. At the moment we do only send Hostas. Other Shade perennials are temporarily only available at plant fairs. Of course we deliver ordered plants also to plant fairs if you want to collect them there. Because of organizational reasons there are at the moment unfortunately no vitis to our nursery possible. Please use the shop on the german page.